Subject: LongIsland.com - Your Name sent you Event details of "Motown in Our Town"
Join the Ronkonkoma Chamber of Commerce on February16th for a great night of music and fun. 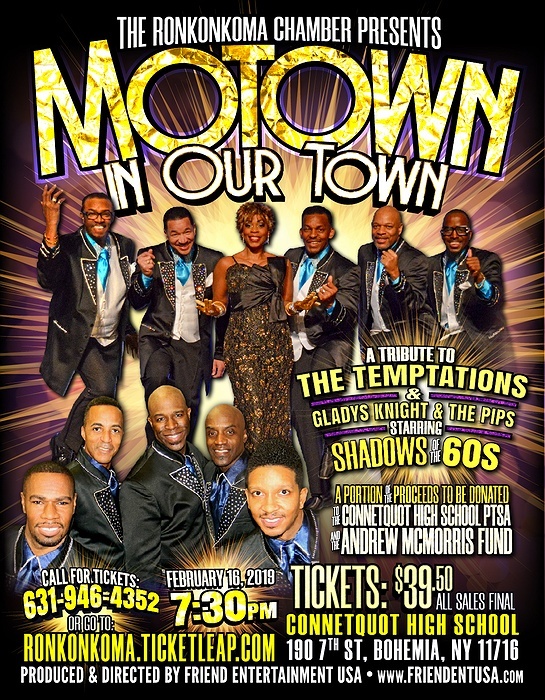 The Chamber will be having a Motown Concert at the Conntquot High School from 7:30pm till 10:30pm. The concert will be a tribute to The Temptation and Glady's Nigh & The Pips. A portion of the proceds will be going o the Connetquot Hih School PTSA. We will aalso be makng donation to the Andrew McMorris Fund. Andrew was the Boy Scout killed by a drunken driver in October. Tickets are $39.50 each. Call teve at 631-946-435 for tickets or more info. You can also go to ronkonkomachamber.com for tickets/info.